Kitchen in Epsom Surrey has been fitted with a very wide shutter set. This kitchen in Epsom Surrey has been fitted with a very wide shutter set. The Shutters cover the kitchen bi fold doors. 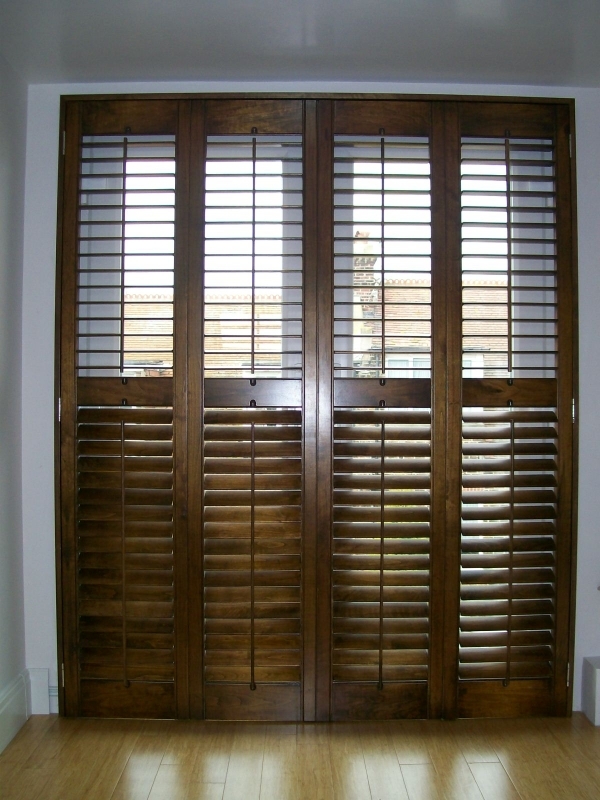 There are eight panels in this shutter set, four of which open to the left, and four of which open to the right. The left opening four shutters are all hinged together, which means that they concertina back on to one another, allowing for easy sliding of the panels. They are fitted on a track, which is a roller track at the top of the shutters; this means that the panels slide effortlessly in the direction in which they are hinged, giving incredibly easy access to the folding sliding doors which work in a similar way. The slats used for these shutters are our larger slats. They look more minimalist, and allow lots of light to pour into the room when the slats are open. The Epsom customer has also chosen to have no push rod to operate the slats, continuing with the minimalist theme. The paint used on the shutters is a Biscuit colour – which matches historical cloudy white. Heritage colours are becoming increasingly popular in homes and home furnishings, so custom shutters colours is something Shutterly Fabulous decided to do as the colours are not only of the now, but actually timeless. The paint used on the shutters and the shutter stains have a mixed in UV protective coating. This gives the shutters added longevity, The UV protected shutters can be fitted at windows with constant sunlight bearing down on them and they will not fade with sun damage. The Epsom kitchen shutters are manufactured in Poplar hard wood which is are best selling range.